17 draws (one free, one purchase reward) only got me Faraday (light rate) on the second rare. I wonder if leveling more than one Freud is worth it. P.D: I don't like the press and forget Hatcher, it doesn't feel good(?) satisfying(?). I dunno why exactly but I don't like it, maybe the animation is too long. The rare here is when the light goes multicolor barely noticebale if i'm honest. 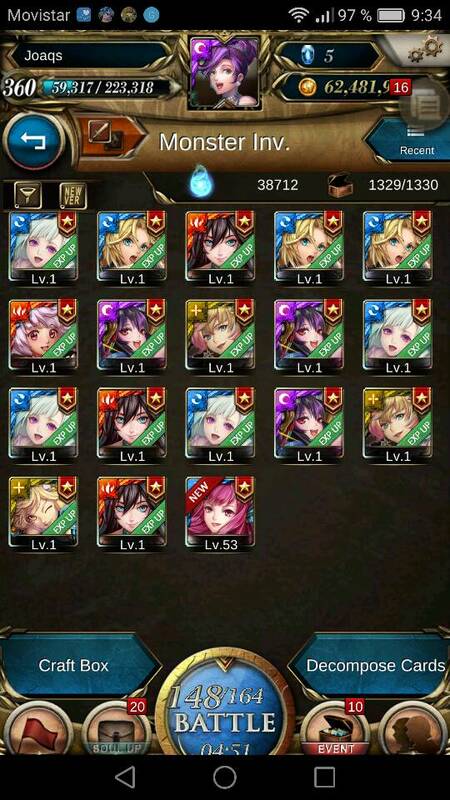 7 draws 2 faraday, in reality i spent most of my diamonds on normal seal since it has boosted elfish, since I had Hurricane Maria while it was out only got Heimdal out of it new and some good dupes. Some weird stuff happened to me. I haven't drawn the seal even once. Didn't buy diamonds or anything. And there's a faraday just sitting in my inventory. And 45 memory travellers thanks to a glitch in the arena. So... the drawing has been excellent for me. (04-17-2018, 09:49 AM)The Darkest Dragon Wrote: Some weird stuff happened to me. I haven't drawn the seal even once. Didn't buy diamonds or anything. And there's a faraday just sitting in my inventory. And 45 memory travellers thanks to a glitch in the arena. So... the drawing has been excellent for me. They posted on Facebook that the mats gotten from the glitch will be removed from your inventory and replaced with the points you used to get them. If you used them to evolve any of your monsters, they will roll them back to their previous evolution. They posted on Facebook that the mats gotten from the glitch will be removed from your inventory and replaced with the souls you used to get them. If you used them to evolve any of your monsters, they will roll them back to their previous evolution. glad to know this. sick with people trying to showoff what they got from the glitch. Had to change souls to points, but TOS English Facebook page posted about it (which I'm sure was just translated from the other page). I'll find a link. Might do another draw before the bonus rate for rares, since the Fruits are hogging my inventory. My goals are Chang'e and Hubble and any rares along the way are welcomed. 5 year playing ToS, I never believe the so-called 200% increasing chance of drawing rare cards. The number of rare cards increased during that period simply because players burned more diamonds. I guess there is only 1 difference, it is between F2P & P2P. (04-23-2018, 02:53 PM)kukingkong Wrote: 5 year playing ToS, I never believe the so-called 200% increasing chance of drawing rare cards. The number of rare cards increased during that period simply because players burned more diamonds. I used to draw for cards with the weekly increased chance bonus. I consistently would pull one of the two increased chance cards in 10 draws, sometimes dupes, rarely neither or both. Never did more than 10 draws a week though. I always thought it was much more than a 200% increase (although it could have been a 200% bonus on top of colour bonus). This was before the days of special seals though.